Gregor Mendel: The "Father of Genetics"
Diploid gene: Each chromosome has two identical copies of each chromosome. Punnett Square: A graphic and mathematical method to predict the genotype of offspring and their traits, as based on the parents' genotypes. The Law of Segregation: Mandel's Third Law which states that organisms that sexually reproduce with meiosis have 2 copies of every gene and only one of these genes is passed to the next generation. The Law of Independent Assortment: Mandel's Second Law explains the inheritance of two separate genes from two different sets of chromosomes. 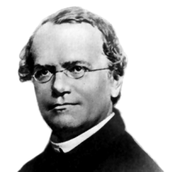 Gregor Mendel, the German-speaking Augustinian monk who founded the modern science of genetics. Gregor Mendel is called the "Father of Genetics". As a German speaking Augustinian monk, Mendel worked with and experimented with peas in order to determine how the color of the peas' seeds, the color of its flower, the shape of the peas and the stem length of the peas were genetically inherited. Mandel's peas like human beings have diploid genes meaning that each chromosome has two identical copies of each chromosome. All of these characteristics and traits, like the peas' stem size and flower color, of his pea crop are called phenotypes. Simply defined, a phenotype is a trait or characteristic that is inherited. Traits of the person can be inherited, like Mendel's peas, but they can also be also be environmental and learned. For example, eye color, skin color and hair color among human beings are inherited but some human traits and characteristics with a genetic basis can be environmental and acquired, rather than inherited. Mandel's studies with pea plants explored three generations of peas and their inherited traits and characteristics. The first generation of peas, the parent pea plants, is, and was, referred to as the P generation or parent generation; the second generation is referred to as the F generation with is also referred to as the F 2 filial generation; lastly, the third generation is referred to as F 3 filial generation. The first generation or P generation of peas was not crossed, meaning that they were purebred, and the F 2 filial generation was self crossed or self-pollinated with the male part of the pea plant which is its piston and the female part of the plant which is its pollen. During his experiments with peas, Mandel used the non crossed, purebred P generation of peas to propagate the second generation of pea plants. These plants were then self crossed. One of these parent pea plants has two alleles with the dominant gene and the other parent has two alleles with the recessive gene. The dominant genes, as the name suggests, are more powerful than the recessive genes of the second parent pea plant. 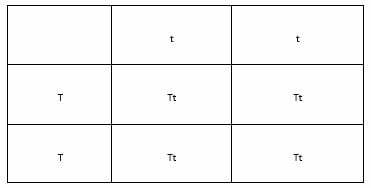 The result of this experiment is shown in the picture below, which is called a Punnett square. The dominant genes are displayed as capital letters and the recessive genes are displayed as lower case letters. As a result of Mandel's experiments with pea plants, the principles of inheritance from one generation to another were understood. Organisms that sexually reproduce have 2 copies of every gene and only one of these genes is passed to the next generation. The male has 2 copies of every gene and the female has 2 copies of every gene. Each parent, the male and the female, contribute one of these 2 copies of every gene to the next generation. So, each "child" has 2 copies of a gene for each trait because 1 + 1 = 2. . This concept and principle of inheritance is Mandel's first law of inheritance called the Law of Segregation. Some genes are obvious when they result from a dominant gene; and others are not obvious, but hidden. The hidden genes, referred to as recessive genes, will emerge in later generations because they will never disappear even though they are less powerful and potent than the dominant genes. 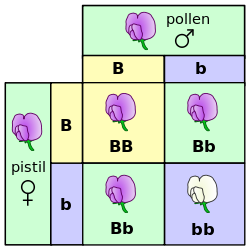 A Punnett square for one of Mendel's pea plant experiments - self-fertilization of the F1 generation. 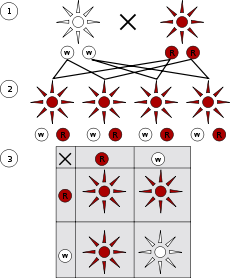 The Punnett Square, as shown in the picture above and developed by Regnal Punnett, is a graphic and mathematical method to predict the genotype of offspring and their traits, as based on the parents' genotypes. As shown in the picture above, both the male and the female parents, have a dominant gene, shown as a capital B and a recessive gene shown as a lower case b. Of the four possible outcomes, 1 of 4 will have BB, 2 of 4 will have Bb and 1 of 4 will have bb; and, 3 of 4 pea plant flowers will be purple like the mother and father and only 1 of 4 will get 2 recessive genes to inherit the white flower. 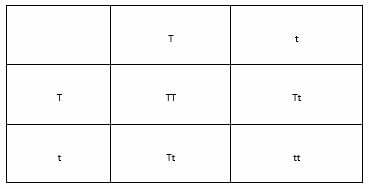 Another example of a Punnett Square, as shown below, can show the results of the cross for the t genotype when one parent is TT and the other parent is tt and these parents have off spring. Notice that the probabilities of all 4 of the offspring being Tt is 100%, however this changes with the second generation. The second generation of these children from the first generation, as show in the diagram above, will be as shown in the Punnett Square below. Organisms that sexually reproduce with meiosis have 2 copies of every gene and only one of these genes is passed to the next generation. The male has 2 copies of every gene and the female has 2 copies of every gene. Each parent, the male and the female, contribute one of these 2 copies of every gene to the next generation with the process of meiosis. So, each "child" has 2 copies of a gene for each trait because 1 + 1 = 2. . This concept and principle of inheritance is Mandel's first law of inheritance called the Law of Segregation. In these monohybrid crossings, the ratio of the dominant to recessive phenotypes is 3:1. As will be discussed next, dihybrid crossings have a ratio of 9:3:3:1. The Law of Independent Assortment, or the Second Mandelian Law, goes further from the First Law of Segregation. This law explains the inheritance of two separate genes from two different sets of chromosomes. For example, the two different sets of chromosomes could be the gene for eye color and the second set of simultaneously inherited chromosomes could be for skin color; similarly, the two different sets of chromosomes could be the gene for pea plant height and the second set of simultaneously inherited chromosomes could be for pea plant flower color. The results of this dihybrid crossing will yield a 9:3:3:1 ratio. 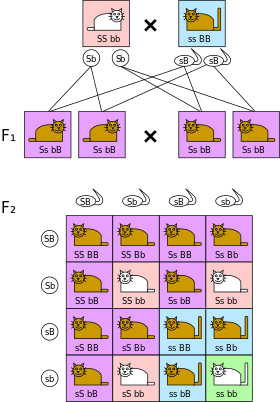 This cross, or parenting, of the two different sets of chromosomes, is referred to as dihybrid crossing, as is shown in the picture below that demonstrates the outcomes of off spring in terms of cat fur color and the length of the cats' tails. Above description: Dihybrid cross. The phenotypes of two independent traits show a 9:3:3:1 ratio in the F2 generation. In this example, coat color is indicated by B (brown, dominant) or b (white), while tail length is indicated by S (short, dominant) or s (long). When parents are homozygous for each trait (SSbb and ssBB), their children in the F1 generation are heterozygous at both loci and only show the dominant phenotypes (SsbB). If the children mate with each other, in the F2 generation all combinations of coat color and tail length occur: 9 are brown/short (purple boxes), 3 are white/short (pink boxes), 3 are brown/long (blue boxes) and 1 is white/long (green box). Based on continued research and scientific study, Mandel's Law of Dominance, unlike the First and Second Mandelian laws, has not passed the muster and the rigors of scientific inquiry to support this Law of Dominance as a law, so this "law" is technically a principle and not a law. This principle of inheritance states that dominant alleles will mask recessive alleles, however, these recessive alleles still exist even though they are masked.